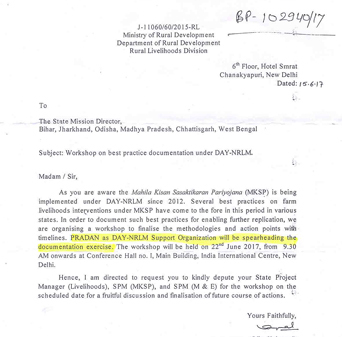 Over the past 4 years, PRADAN as a National Support Organisation (NSO) to the Ministry of Rural development (MoRD) has been supporting the Deen Dayal Antyodaya Yojana-National Rural Livelihoods Mission (DAY-NRLM) as a knowledge and capacity building partner, providing strategic as well as thematic support on livelihoods. NSO is helping the NRLM develop a framework to identify and document Best Practices that have emerged under the Mission supported Mahila Kisan Sashaktikaran Pariyojana (MKSP). The MKSP is a national level initiative to enhance incomes and empower women through sustainable agriculture, in which the Mission has invested about INR 10 Billion, and is touching lives of nearly 4 million rural poor women. The Best Practices evolved would be the knowledge resource to be emulated in scale by different State Rural Livelihood Missions (SRLM) and other partner agencies.